I love this week's Paper Craft Crew's sketch challenge. So many fun elements. I just couldn't wait to create a card. The fun background was created with a little ink and aqua painter and a little splatter of Gorgeous Grunge. This is one of my favorite stamp sets! It's so perfect for the stained glass look! 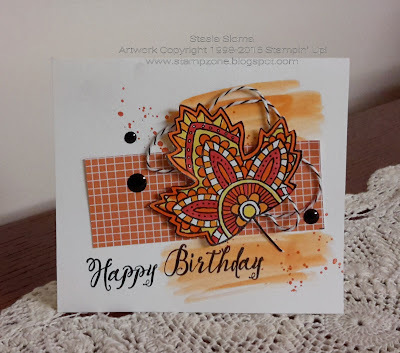 Beautiful card and I love the way you used the sketch. Thank you so much for playing along at the Paper Craft Crew this week. Just beautiful! What a pretty leaf!